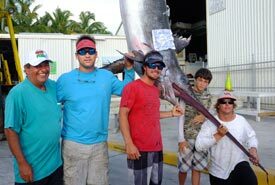 This 520-pounder is likely a record for a swordfish caught off the Florida Keys in daylight. A 520-pound swordfish caught off Islamorada in the Florida Keys on March 25 is, while noteworthy, not really a rare sight. But what makes it truly special is that it was landed in broad daylight, making it possibly the largest broadbill ever caught on rod-and-reel during daylight hours off the Keys. Caribsea Captain Kenny Spaulding led angler Fred Beshara, 67, to the impressive catch. The semi-retired contractor/developer from Youngstown, Ohio, caught the fish on 80-pound-test tackle with a Daiwa Dendoh MP3000 electric power-assist reel. Crewmembers on the boat were mates Conan Yates, William Bassett and Spaulding's 12-year-old son, K.C. The big fish bit on a squid in about 1,850 feet of water, said Spaulding, who skippers a 44-foot Carolina-designed sportfisherman. "We were drifting along for about 15-20 minutes and all of the sudden there was a little nibble and then an explosion," Spaulding said. "We backed down (the boat) to try to stay on top of him." Spaulding, who has been an Islamorada captain since 1997, said it required about two hours to get the fish close to the boat and, towards the end of the fight, it leapt completely out of the water. Incredibly, when they got the fish next to the boat, another swordfish suddenly appeared. "That fish was glowing and lit up like a Christmas tree," he said of the second broadbill. "I've never seen anything like that in my life." Spaulding said they tried to bait the second, smaller fish without success. "We got real excited and reacted like we were fishing for sailfish," he said. "But when it wouldn't eat, I told the crew that we had to focus on boating the big sword." Two veteran Keys captains, daytime swordfishing pioneer Richard Stanczyk and Jim Sharpe, acknowledged the achievement. The team of anglers crowd around their massive catch. "We've seen fish in the 400- to 475-pound range, but I've never heard of a 500-pound or heavier fish caught in the Keys during daytime hours," said Sharpe. Stanczyk said a 612.75-pound broadbill was caught off Key Largo at night. That fish, reeled in May 7, 1978, by Stephen Stanford, is still a state record, according to the Florida Fish and Wildlife Conservation Commission. Beshara's swordfish was the largest fish he has ever caught and was particularly gratifying since he was targeting the species. "After having my kids, this is the second best thing in my life that has ever happened to me," Beshara said. "I was so excited, I couldn't eat and couldn't sleep afterwards." News of the catch spread quickly among Beshara's hometown friends and other residents. "All of the people in Youngstown now want to come fishing down in the Keys with me," Beshara said.